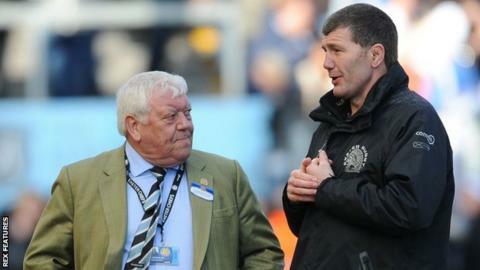 Exeter Chiefs chairman Tony Rowe has warned against the escalating player salaries in the Premiership. A substantial rise in television revenue aligned with changes in the salary cap has seen players paid in excess of £500,000 per year. But Rowe has urged that wages must not spiral out of control. "There is a concern amongst the Premiership chairmen that we do need to try to control player salaries," Rowe told BBC 5 live. "Every time we lift the salary cap, the wages go up and up and up," he added. "Everybody appreciates that most of these guys have a short time as a professional sportsman and need to earn a lot of money - and their career could finish tomorrow - but we need to try to strike a balance." Rowe's club is preparing for its maiden Premiership final on Saturday, just six years after winning promotion from the Championship. And he feels the extra money coming into the game is currently being misused, with individual players being paid extortionately rather than revenues going towards growing and improving squads as a whole. "It [should be] about us getting bigger squads, employing more people, and improving facilities," Rowe continued. "I think the agents are a major problem. Every time we lift the salary cap, they come along and want to bump all the salaries up another 10-15%. "It's very difficult if every time you get extra money it's disappearing on players' salaries." Rowe believes the clubs should act now before the situation gets out of hand, adding: "I do not want to see us go the way of football. "I don't think we will, but I think we should see a bit of sense, and put things in place now before it does get away from us. "Maybe once we have got our (long-term) agreement with the RFU sorted, maybe that's the next area we should concentrate on." "My ambition was to get us into the Premiership. We achieved that six years ago. And then the ambition was to win the Premiership and win to Europe. "We can do the first bit this coming Saturday, and move on to Europe another day." Hear from Tony Rowe on the 5 live Rugby podcast.